October seemed like such a busy month to me. I honestly have no idea why. I don't have little ones to come up with costumes for, I didn't have a party to plan, I didn't even have family dinner every week. But for some reason I just felt so busy. Oh well, I am sure it will be nothing compared to what is coming up right? I mean we have Thanksgiving and then Christmas, and I swear the older I get the faster it all flies by. Which, by the way, drives me absolutely crazy. I mean really? It is a proven fact that the older we get the more we appreciate things, everything!! Yet it seems that it all goes by so much more quickly. Couple that with the fact that, as I get older, my memory seems to be getting shorter and shorter? Anyway, the up coming two months are going to be filled with food, fun, and family. That makes me a very happy girl. I am excited to get into my kitchen and whip up some awesome holiday dishes for you. So stay tuned!! 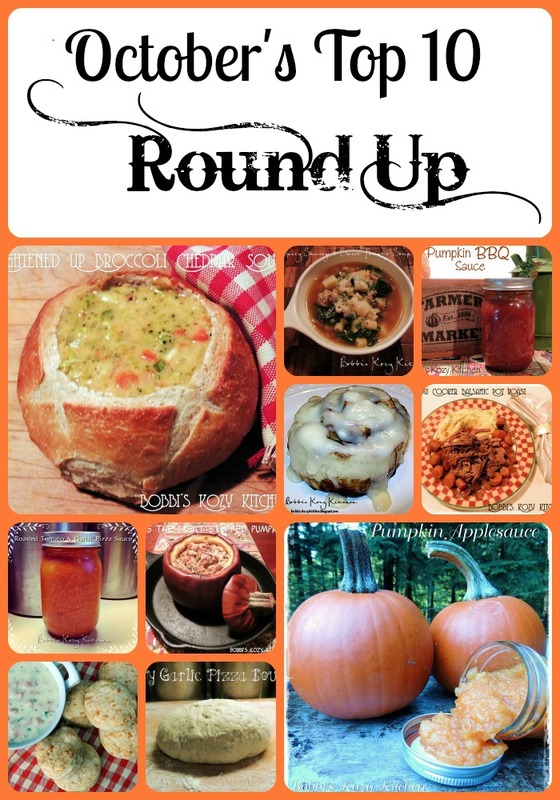 But until then, here is a round up of October most viewed recipes. I don't know why, but October just flew by for me too. The Pumpkin applesauce sounds like something I would probably enjoy. Going to go check it out. October went by quickly. We have sooooo much pumkin to use up and I was looking for recipes. Pumpkin Applesauce sounds like a good way to use some of it up! If you like pumpkin like we do you have to try the Pumpkin BBQ!! It is our favorite BBQ sauce now. I love Broccoli Cheddar Soup and whenever I go to Panera (do you have those by you?? ), that is what I get. In a bread bowl, too! Yum. Yes there is one local :) that is where I got the idea!! I will guarantee that you will love it :) everyone asks for it here!! The bread soup likes amazing. I used to love those when I was a kid. I had never had one until I went to a local restaurant with my daughter and knew immediately that I wanted to make it at home! I actually don't remember much of October. My birthday was just 2 weeks ago and turning 30 was HUGE for me... but I don't remember many days before and the days after. That's so odd! --Pumpkin Applesauce sounds amazing!! I will have to give it a try! October... Don't you mean the whole year?? This year has gone by in a flash on me. These look like some really good recipes worth checking out. Thanks for sharing them with us. Oh I know Crystal!! It just seems that it spins out of control over this time of year! I am off to find your pot roast!!! Great month of recipes...your highlights all sound terrific! That cinna bon looks so yummy! But this time of the year is gonna be hard! I am on a weight loss journey! October was definitely a very busy month for me and I shudder at the thought of how busy the next two months will be. These are some great recipes as we transition into the Fall and Winter. Yes, hopefully we will be able to catch our breath after the first of the year!! Unfortunately I know precisely what you are saying and mean by time seems to fly by even more quickly the older you get--and the memory gets shorter! Which reminds me-----I have to somehow get into that new state insurance website and confirm that I really want the insurance I picked before I do not have any at all---Nov and Dec will be kind of hectic--My Mom's 91st birthday, Thanksgiving, my nieces baby shower-but first things first--convincing my cat that it really isn't 12 am it is 11 am!!!! LOL I know what you are saying about your kitty! I miss having a cat though. Congrats to your Mom, 91? That is awesome!! Agreed! October had flown by, and now its November......I guess it's time to think about Christmas soon! (yes, I said the C word!). Nice post. October went by fast for me too and I know next October will go by even faster. I love cooking and even more I love eating. My wife and I are very healthy eaters. I think I am going to get some good ideas from a few recipes from this blog. Thanks for sharing. I am so glad you are enjoying my recipes Eric!! Thanks so much for stopping by. Please do!! I love veggie stock too! I agree--October went way too fast! And to think that we are just now heading into the busy holiday season that ALWAYS flies by. I have to check out all of your recipes. They sound delicious. Definitely looking forward to trying the broccoli cheese soup. I sure hope you do get a chance to try it. We almost pulled a batch out of the freezer for dinner tonight. Went with the Campfire Stew instead though. I have been drooling over your recipes all month. And, yes, for some reason October seemed busy for me too. I just made soup bread bowls last night! They were so good! Pumpkin applesauce sounds delicious! I think it would be awesome in baked goods in place of regular applesauce. Yes I used it for pancakes the other day! October went by quickly for me too! I love the 1st recipe, it sounds and looks yum! Hopefully November wont go as fast!! I hope you give the pumpkin applesauce a try! !